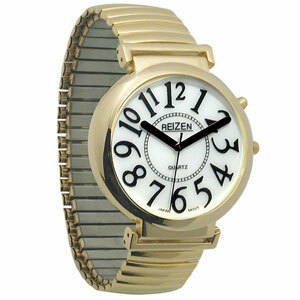 REIZEN Watch with White Face and Illuminated Face Dial - Expansion Band. These high quality Quartz Movement Watches feature a extra wide dial for easy viewing, extra large thick hands, large numbers, gold finish and 1 Year Warranty. 1. Illuminated White Face Dial, Black Numbers with Exp. Band. 2. Illuminated White Face Dial, Black Numbers with Exp. Band. 3. Illuminated White Face Dial, Black Numbers with Exp. Band. 4. Illuminated White Face Dial, Black Numbers with Exp. Band.